Set among tropical gardens, The Hotel Sofitel is Manila's only business resort by the bay, adjacent to the convention center and minutes from downtown Manila. The Westin provides private offices and comprehensive services for business travelers, and the new Westin Fitness Club offers a variety of spa and exercise options in addition to the putting green, driving range and championship tennis courts. During season, don't miss the nightly poolside barbecue, or unwind in the entertainment center's music lounge, disco or sports bar. The Hotel Sofitel artfully combines the best features of a business hotel and a resort in its 609 thoughtfully appointed guest rooms and luxury suites. All accommodations offer color television with cable, refrigerated refreshment center and international direct-dial telephone with fax modem and bathroom extension. 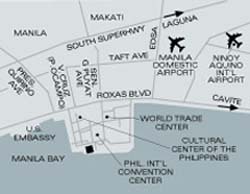 From North/South: Take Roxas Boulevard all way.